Snowy night at Edward street, Toronto. 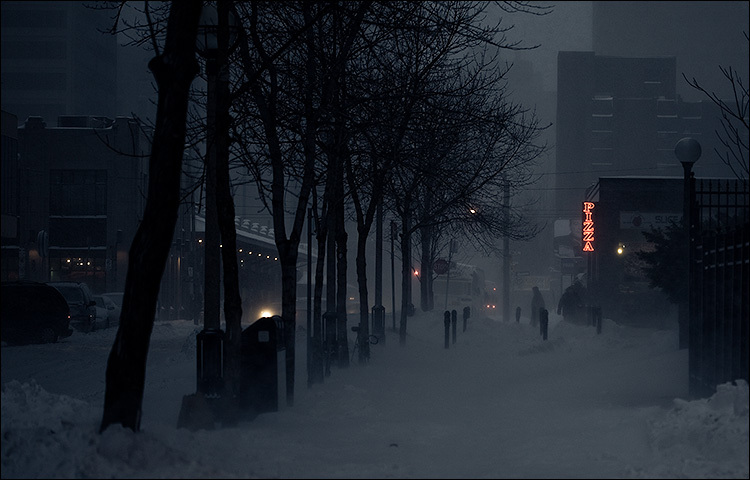 After looking at this photo I realized the tones are partly inspired by 30 Days of Night. I was asked about how I protect my camera in snow storms or other wet situations. My solution is pretty cheap, I use a Ziplock or a plastic bag and cut a hole at the bottom and use elastic bands to hold the bag around the lens. I also constantly try to dry the camera with a piece of fabric or paper towel, especially around the buttons. But still, my camera was soaking wet after the snow storm, since I was walking for hours in heavy snow, but it seems like it's still functioning.